We are having warmer than normal weather here in the interior of Alaska. 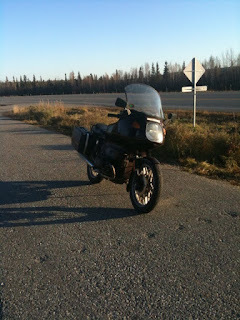 This morning, it was 28°F and clear and with no moisture on the road, so it was a great ride in. Since the weather guessers are projecting clear days for the rest of the week, I dug out the bike from the back of the garage. I rode in just before sunrise, a bit chilly on my neck but otherwise plenty warm. It has been a couple of weeks since I've last ridden and I was trying out a new pair of insulated gloves that a friend had given me so things felt a bit awkward. The fingertips of the gloves would touch the levers and that seemed to throw me. This is near Ann's Greenhouse near the base of Ester Dome. As you can see, no snow and the leaves are pretty much gone. I can only remember a couple of years when we haven't had snow on the ground by the middle of October so this is real unusual (or else I have a really bad memory). Yesterday, it had warmed up to the mid-50's and there were a lot of bikes running around but errands and other commitments kept me off the bike. In spite of winter, I don't think I could ever get used to living elseware. I just returned from San Antonio, TX, and I thought that their weather was miserable. Everytime I headed outside, my glasses would fog up due to the humidity. It was horribly warm and muggy the whole time I was there. Because of the weather, I got in very little exercise and arrived back home feeling very tired and run down. Activity, specifically walking, seems to really help me feel better.